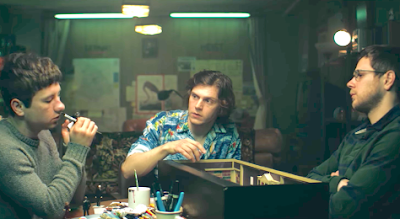 There have been a few trailers for Bart Layton's crackin' good heist thriller, American Animals, which opened to rave reviews at Sundance. It was one of my favorites out of the festival, for more than just the performances by Barry Keoghan, Evan Peters, Blake Jenner, Jared Abrahamson, Ann Dowd and Udo Kier although they were a big part of it. The reason was the way Layton blends reality and fiction with a unique of flashback, an aspect that has been hidden in every trailer released. That aspect is hidden yet again here, and I fear that without it people will feel this is just another heist movie they can wait to watch on Bluray. Nah, you should go see it in theaters on June 1st. The story centers on a pair of middle-class Kentucky kids who set off to make their mark by stealing the local college's rare collection of books, including John James Audobon’s The Birds of America, one of the most valuable books in the world. Coincidentally, that book is going up for auction in June and may fetch $12M or more. Do yourself a favor and check out American Animals if it's in your town next month.